As the second largest city in Nevada, the city of Henderson has emerged as the second most populous city in the state. Boasting an incredibly modern infrastructure, great year round weather, and having the designation as being one of the safest cities in America, families and individuals alike will find that is a most amenable place to call home. The housing outlook is solid, with home values and rental prices showing an increase in recent years. With many job opportunities and an abundance of great schools in the area, the city will likely continue to grow in the future. 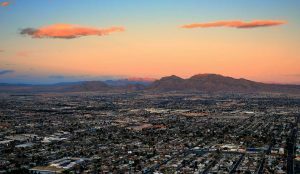 Nestled in the heart of the greater Las Vegas Metropolitan area, Henderson is a geographically vast area comprising roughly sixteen miles, and it possesses great potential. The population is currently just under 300,000 giving it that small hometown feeling that many crave, while still having all of the modern conveniences that today’s society demands. The city itself came on the scene in the midst of World War II, spurred on by the development of the Basic Magnesium Plant. This enabled the area to rapidly become the primary source of magnesium through the United States, and it was dubbed the ‘miracle metal’ during the war. Needless to say, this fact helped along the economy and enabled the city to continue to grow in population and stature. As local industries continue to evolve, the city was officially incorporated back in April of 1953. At that time, the population stood at 7,410 and has continued to grow ever since. Back in 1988, the city suffered through a major disaster when the Pacific Engineering and Production Company of Nevada saw its rocket fuel factory literally explode and catch fire. Six explosions would ensue, engulfing nearly the entire city. A great deal was learned from this disaster, but it also helped to bring along the development of residential and commercial property, moving Henderson away from its industrial roots. This area of Nevada has a hot desert climate, allowing residents to enjoy mild winters and hot, dry summers. Even given its desert status, there is still the occasional snowfall in the city. Summertime can bring about monsoon storms, resulting in torrential rain and thunderstorms at time. The weather combines to provide people with an abundance of outdoor activities to participate in year round. For those that like a bit of gaming action, the Las Vegas Strip is never very far away. One does not have to participate in gambling to enjoy this area of the state, however, as the metro area plays host to a number of world class entertainment acts on a regular basis. For those looking to get outdoors, the Hoover Dam is only miles away. One of the more popular ways to enjoy this spectacle is to take a Hummer Tour of the area. You can also take the same mode of transportation and see the Grand Canyon in a day. With so much beauty never very far away, it is easy to see why so many people love calling this area of Nevada home. The housing outlook throughout the city is strong, with the median home value of roughly $267,000 having increased 6.7 percent in the last year. It is predicted that values will continue to rise about 5 percent in the coming year, putting the median listing price at $150 per square foot. This is higher that the median price per square foot of $131 that the Las Vegas Metropolitan area is currently reporting. With an average rising price of $325,000 and a median rent price of $1,375 it is easy to see why there are numerous opportunities for property management in Henderson. The average rent alone is more than $100 higher per month than in neighboring Las Vegas. As one looks for a place in the area to call home, keep in mind that there are nine distinct neighborhoods scattered throughout the city. Homes ranges in average value from just over $300,000 in Green Valley Ranch to under $210,000 in Whitney Ranch. With 39 different public and private schools scattered throughout the city, one is never far away from a great academic institution. At the present time, just over 30 percent of the residents are single and 74 percent are home owners. The median age in the city is 40, setting a youthful tone for the area that is family oriented. The median household income is just under $67,000 and some 36 percent of adults have earned a college degree. If you are interested in learn more, contact us for a comprehensive market analysis of your rental property. We will get you the information and data that you need to make an informed decision. Our property management team specializes in residential areas throughout Henderson, NV. We offer multiple services to take your rental property and convert it into reliable income. We have a thorough screening process that helps to identify the right tenants for your property. Our team works hard to keep both parties happy through effective communication, bullet proof lease agreements, and timely monthly rent collection. We offer maintenance services to enhance the property and ensure that it will retain or increase in value. We oversee everything, allowing you to sit back and relax and know that your property and your tenants are in good hands. Contact us today if you are ready to receive a comprehensive analysis of your rental property and to inquire about our Henderson area property management services.